Dr. Gray is a graduate of the University of California School of Dentistry at San Francisco along with being alumni of San Diego State University. He has been providing high level, quality care as a sedation dentist and cosmetic dentist for over 25 years. His education did not stop after graduating from Dental School. He is a continuous student and spend a tremendous amount of time each year to stay on top of the latest advances for cosmetic and sedation dentists. Dr. Gray has attended the Las Vegas Institute of Cosmetic Dentists, one of the nation’s premier post graduate training facilities and was recognized for his outstanding achievements in the field of COSMETIC DENTISTRY. He is also a graduate of the Kois Center, where he not only is a mentor, but was recently asked to become a Clinical Instructor. He flies to Seattle, WA several times a year to help train other dentists in these advanced cosmetic and restorative treatments. Dr. Jeff Gray was amongst the very first in the United States to use “SEDATION DENTISTRY“. This incredible technique allows those patients who have avoided the dentist for years to comfortably undergo treatment they may have avoided for years while they comfortably snooze in the chair. Now they can find a trained and qualified sedation dentist and they can be on their way to good dental health. Of course, not just any dentist can be a sedation dentist. La Mesa sedation dentist Dr. Gray has had extensive training in this area and has safely, successfully and more importantly comfortably treated over 2000 fearful patients using this 1 pill sedation dentistry technique”. He has also chosen to see just one patient at a time so that the entire attention of the office can be focused on just you and your care. Dr. Gray absolutely loves being a dentist and helping improve the lives of his patients. It is what being a dentist is all about. 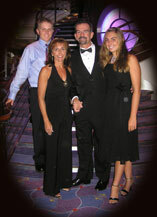 Dr. Gray enjoys spending time with his wife Mary and his children, Jamie and Kyle, and watching them grow. Dr. Gray also races offroad motocross and loves baseball. He’s had the pleasure of attending PADRES Fantasy camp the last few years and currently plays Adult Baseball nearly every weekend. Please browse the rest of our site and feel free to contact us using the form at the right or just click the Click to Call button to the right to allow us to help you with any questions or concerns you might have. Thanks for taking the time to enjoy our site. You’ll enjoy our office and our team even more.